The $550 million Omni hotel in the Seaport District is billed as a new way of developing real estate in Boston, giving minority-owned firms a stake in ownership, construction and operations. John Moriarty & Assoc. 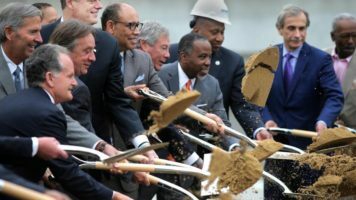 is splitting the construction duties at the Omni with minority-owned Janey Construction Management and Consulting, after property owner Massport set aggressive minority participation goals for the 1,055-room convention hotel. The two construction companies will partner next on The Viola, a $425 million mixed-use project in Back Bay led by African-American developer Don Peebles in his first Boston project. “We’re trying to keep this thing going and it was kind of a natural,” Moriarty said. 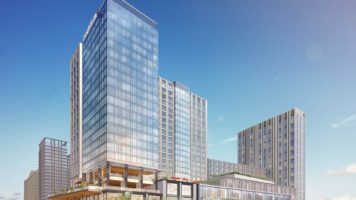 Massachusetts Department of Transportation selected Peebles Corp. of New York in 2015 to develop its parcel 13, an air rights project above the Massachusetts Turnpike at Massachusetts Avenue and Boylston Street. Peebles has proposed a 156-room hotel, 88 condominiums and 85 apartments along with 20,000 square feet of retail space. The project is in predevelopment pending state and local approvals and has a tentative 2019 groundbreaking. Peebles is showing increasing interest in Boston development. His firm was one of 12 that submitted proposals last week to build a 550,000-square-foot office building on Massport’s parcel A-2 in the Seaport District. Moriarty and Janey are already partnering on construction of Pipefitters Local 537’s new training center in South Bay, as a trial run for the Omni hotel work which officially broke ground Tuesday. The Omni project is led by Boston-based Davis Cos. Developer Richard Taylor and the late architect Howard Elkus approached developer Jonathan Davis about assembling the team including participation by minority-owned firms including architects Stull & Lee Inc. and Moody Nolan. 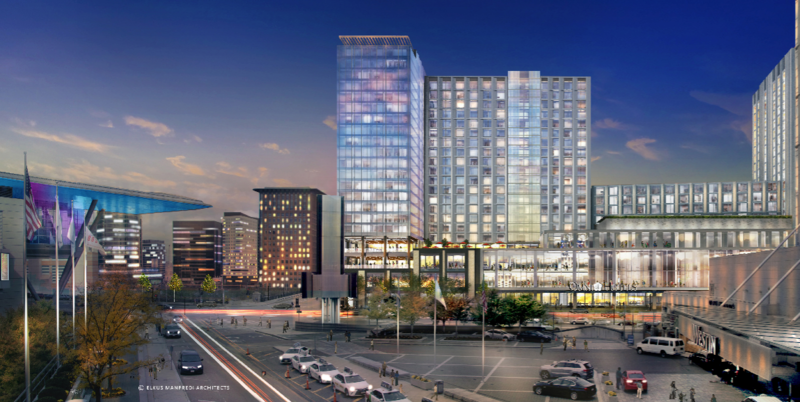 When reviewing proposals for the 2.1-acre Omni site at 440 Summer St., Massport’s real estate committee gave a 25 percent weight to strength of development team’s diversity and inclusion. “It’s a model for everybody and we’re going to work aggressively hard on incorporating it into a lot of our activities,” Gov. Charlie Baker said during Tuesday’s groundbreaking ceremony. The $330 million construction loan was led by U.S. Bank, M&T Bank and Santander Bank with participation by Berkshire Bank, MidFirst Bank, Independent Bank, National Bank of Alaska and Raymond James.